Greetings and Happy Monday Morning!!! Hello Yogis and Yoginis!!! Will you “weight”?!!! Yes, it is time to deepen our sculpting, toning, and strengthening with hand weights this week!!! We will embellish our power, as we focus on our core, breath, and alignment!!! 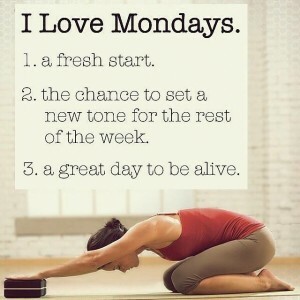 Be ready for increased energy, vitality, and vigor, as you come to the mat this week!!! Our Sanskrit focus is “Maitra”, or expressing “lovingkindness”, first for ourselves, and then to others in our relationships of life. Our Mudra (hand gesture) is “Vitality”, which evokes the energy for “get a move on”, and promotes overcoming chronic tiredness. Our music for meditation this week is the beautiful, “Claire de Lune”. As you listen to this beautiful peace, silently chant, AUM Shanti, Shanti, Shanti, sending out the Universal, Cosmic message for “Peace”. The February YFL newsletter will be on your email desk at 10 a.m. 2/1!!! It describes our upcoming special events, and provides some useful information for yoga, meditation, health, diet, etc.!!! If you are looking for a healthy gift for your significant other this Valentine’s Day, then look no further, a gift certificate to YFL for yoga and/or meditation would be perfect!!! This entry was posted in Uncategorized on January 30, 2017 by Deb Potts. 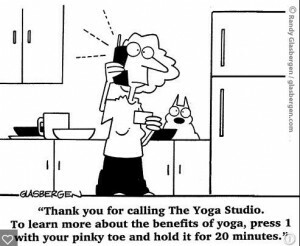 Greetings Yogis and Yoginis!! I am choosing to err on the SIDE OF SAFETY this morning!!! YFL WILL BE CLOSED TODAY, 1/23!!! I am suggesting you to stay home and be safe!!! At the writing of this blog the rain is again coming down hard, and I am not sure about our road conditions, flooding, etc. Classes WILL RESUME TOMORROW AT 12:30 WITH SOPHIE!!! This week’s practice will emphasize Classic Hatha with power, vinyasa flow. Our Sanskrit focus is “Sankalpa”, or to practice with personal intent. Our hand gesture or mudra is “Ushas”, which connects us to the energy of all things good. Our meditation focus will be “Shanti”, or peace, and is set to “Pure Ceremony” Imaginary. This entry was posted in Uncategorized on January 23, 2017 by Deb Potts. Greetings Yogis and Yoginis!!! Happy MLK Day!!! It is a holiday, but YFL is OPEN!!! This week we will be focusing on using the wall as a prop for resistance. This helps with alignment, grounding, sculpting, and strengthening our asanas. This acquired information with the wall will then, hopefully, transfer to our practice in subsequent weeks without the wall. Our Sanskrit focus will be is “Dharma”, literally translated means “that which holds together”. More simply interpreted it means duty, law and order, following one’s path to truth. It secretly conditions all of our activities. Our mudra (hand gesture) focus is the “Skankh” or shell. The gesture for deep-seated intuition. The right hand represents the shell wrapped around the thumb of the left hand, which represents the pearl, or your Higher Self. This mudra may be combined with deep inhalations followed with chanting AUM on long exhalations. This week’s meditation focus is “Strength”, and may be combined with the music of “Zen Pause”…”Close to my World”. This week’s quotation is “See with your Heart”. The deadline for our Artistry of Yoga 200-hour Teacher Training program is fast approaching, 1/27. Registration details are available on the website. We have developed a new 16-week, Semester Format. The training begins on 2/8 and ends of 6/3. We will meet every Wednesday from 5:30-9:30 p.m, and each Saturday from Noon- 6:00 p.m. We will NOT meet on 5/27 or 4/15, Memorial Day Weekend, or Easter Weekend. As part of the teacher training program we will be including the following special events for our trainees, which will also be open to the public: 3/25: Yogapuncture w/Ansley and Monica, cost $40, 3-5 p.m., and space is limited. Sign-up at the studio, fee is $40, and on 4/8: Kirtan Workshop w/Sandi, pre-pay $15, at the door $20, from 1-3 p.m.
Deb and Carol will be hosting their annual Santa Rosa Plateau Yoga-Hike sometime this Spring, so watch for the details, coming soon!!! This entry was posted in Uncategorized on January 16, 2017 by Deb Potts. 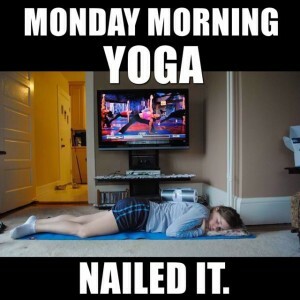 Let’s Relax into Stretching: Triple “R” Week!!! It is Triple “R” week!!! Let’s relax, renew, and restore into our yogic stretching!!! I hope you are continuing your 2017 “Resolute Breath” 365 challenge, BREATHE!!! Our Sanskrit focus is ‘DHANYA VAD’, or “I feel grateful”, and our Mudra focus is the “Relaxation Hand Gesture”, or “Let it Flow” accompanied by a supine body mudra. Our meditation focus is “Let it Flow”, set to Tom Barabas’s Sedona Suites, Nuages. Kim’s monthly Mommy & Me class is today at 11 a.m.-Noon. The cost is $10 for one child, and $15 for two. This interactive class between parent and child is designed for baby-4 years old. Deb’s next 5-week Meditation I class begins tomorrow evening, from 7:30-8:30 p.m. You may still register via email or phone call. The Artistry of Yoga- 200 hour-Teacher Training program begins on 2/8. It will meet for 16 consecutive weeks, each Wednesday from 5:30-9:30 p.m., and each Saturday, from Noon-6 p.m. Registration is OPEN through 1/26. Click the AOY icon button on the website for all the details. This entry was posted in Uncategorized on January 9, 2017 by Deb Potts. Weighing in on a New Year!!! Greetings from YFL, and Happy New Year!!! If you read the YFL January newsletter yesterday, you know that I challenged you via my poem, Resolute Breath, to stop each day (365), and rest in your breath for as long as you need to slow down life’s pace. It is an easy, and very transformative practice. I encourage you to take the challenge!!! This week will usher in 2017, as we “weigh in” with our hand weights. The practice is strong, exhilarating, and powerful!!! Our Sanskrit focus relates to our 2017 daily focus, the breath, or “PRANAYAMA”, one of the 8 limbs of yoga practice. It means to control the breath with ease, and if you accomplish this practice, the benefits are manifold. Our mudra, is “USHAS”, to connect to all things good in life. Your meditation focus is “REST IN THE BREATH”, and may be practiced as you listen to “Sacred Earth’s”-Bhakti Hreem. Sophie begins a new four week Ayurvedic Transformation series next Monday, 1/9, from 12:30 to 2:00 p.m., and the cost is $99. You must pre-register and pre-pay. Kim’s monthly Mommy and Me class will meet next Monday, from 11:00 a.m.-Noon. The cost is $10 for one child, and $15 for two. Please pre-register and pre-pay. Deb begins a new 5-week Meditation I class next Tuesday evening, 1/10, from 7:30-8:30 p.m. The cost is $70, and we ask that you pre-register and pre-pay. The new Winter Schedule is posted on the website. 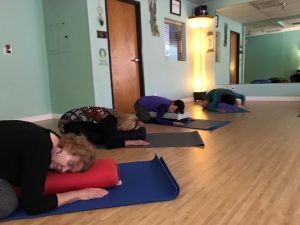 Joyce is taking a sabbatical for the Winter Session, but will return with her Classic Hatha sessions for the Spring Session at YFL. There is still time to register for our 2017 Artistry of Yoga-200 hour-Teacher Training Program. Registration ends on 1/27. The program schedule has been modified to a 16-week program, with weekly training on Wednesday, from 5:30-9:30 p.m., and every Saturday, from Noon-6 p.m. The start date is 2/8, and the end date is 6/3. There will be no class on 4/15 and 5/31. Click the AOY icon button on our website for registration details. This entry was posted in Uncategorized on January 2, 2017 by Deb Potts.